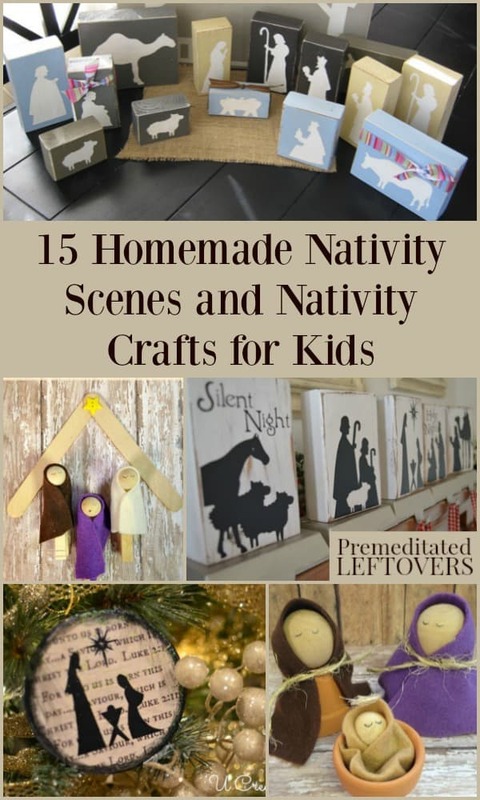 Here are 5 homemade nativity scenes that make great Christmas decorations and 10 nativity crafts for kids to make themselves. Last year I shared that we don't really do Santa at our house. Instead, we celebrate St.Nicholas Day which is December 6th. Our only nod to Santa is when we serve as a “Secret Santa” for families in need in our community. So we don't send mixed messages to our kids, we don't decorate our home with Santa decorations. Instead, I use a lot of greenery, ribbons, wreaths, and nativity scenes. I decorate our home shortly after Thanksgiving. I like to have my decorations in place before the first Sunday of Advent (December 1st this year) as that is when we begin celebrating Christmas. As friends and family realized we didn't include Santas in our Christmas decorations they began giving me Nativity Scenes. My favorites are the ones that are made of wood because I can let my youngest son play with them without fear of them being broken. One of my favorite memories is of the Christmas when my youngest son was one. He kept pulling baby Jesus out of the manger and then have the camels “eat” the hay out of the manger. No sooner would I put Jesus back, when he would pull him out again. I tried explaining this was where baby Jesus was supposed to sleep. He shook his head violently no. I asked him where baby Jesus should sleep and he said, “His mama should hold him”. Since I was a baby-wearer, I couldn't argue with his logic and we taped baby Jesus into a makeshift carrier on Mary. That is the beauty of having touchable decorations when you have children in your home. DIY Block Nativity Set from Ginger Snap Crafts is a very unique and rustic way to create a nativity scene at home. Nativity Stocking Holders from U Create incorporates a holiday staple, the stocking, in with a scene you can make the center of your mantle. O Holy Night from Free Craftz is a simple way to create a nice scene using wood. Nativity Ornament from U Create allows you to hang the story of the Savior's birth on your tree. Rustic Holy Family from Learning to be Me is a very nice way to make a simple and minimal scene. 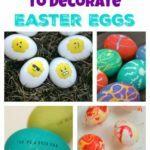 Flower Pot Nativity Set from Premeditated Leftovers uses a unique medium and is fun for kids to create. Clothes Pin Nativity Scene from Premeditated Leftovers is an easy way to help little ones make the scene. Wooden Doll Nativity from Little Inspirations not only makes a simple set, but it can also be something kids can play with, too. Felt Nativity Advent Calendar from Barefoot in the Kitchen also makes a nice toy and a fun way to explain the story to little ones. Nativity Scene made with Recycled Items from Pink and Green Mama uses upcycled items to create a perfect scene for kids to make. Nativity Hand Puppets from eHow shows you how to create a fun toy for kids to act out the Christmas story. Magnetic Nativity Scene from Freshly Completed is another playset that allows your kiddos to make the scene. Nativity Scene Made from Legos from Science.UVA is the perfect thing for kids who love to build. It's actually pretty incredible! Printable Nativity for Kids from Catholic Icing is an easy nativity to make for little ones. Stained Glass Nativity Craft from Meaningful Mama takes on a more crafty approach but is a good one to do with preschool to younger grade school age.